At this time of year, I find joy in putting some great ingredients together and letting them braise slowly in the oven. This is inspired by a dish I had once in a London restaurant. When I returned from my trip, I worked on recreating my meal. Over the years I have tweaked the ingredients. I believe this version is actually better than the original! 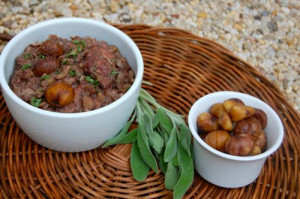 I attribute it to the final ingredient added in this last version the juniper berries, it adds a nice herbal under note to the favor of the stew. On the next cold wintry night fill your kitchen with the warmth and fragrance of this delicate stew. From by the bay wishing you warm food memories! Preheat oven to 350F. Mix flour together flour with salt and pepper in bowl. Add pork cubes and coat well. In dutch oven heat both oil and butter, sauté pork cubes until browned on all sides. Add garlic and sauté another minute. Next add the red wine, bay leaves, juniper berries, sage and chestnuts. Bring to a boil, then turn off flame. Cover and place into the oven for 2 ½ hours, stirring occasionally. Serve with noodles, rice or steamed spinach. This entry was posted in main dish, pork and tagged chestnut recipes, comfort food recipes, pork recipes, red wine recipes, stew recipes, wine recipes, winter foods, winter recipes on May 24, 2014 by entertainingbythebay. I think people fall into one of two categories at Thanksgiving – those who love leftovers and those who hate them. I fall into the love category. Although Thanksgiving lends to alot of food in the house, I love the challenge of trying to make something new out of what is left. Many times I enjoy just reheating dinner from Thursday, but it’s more fun to fiddle around with the ingredients so that it becomes a dish you would just love to eat at any time of the year. The first recipe is my take on a post thanksgiving day sandwich. I use a nice sliced brioche bread and make a cranberry mayonnaise using leftover cranberry sauce. It’s layered up with turkey, pear slices, brie and proscuitto. The brie and proscuitto are leftover from my Thanksgiving cheese platter that I serve accompanied by fruit – including of course some pears. The second dish is Hunter Stew with turkey. 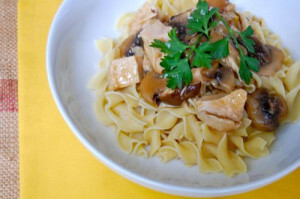 This is a french stew that typically uses chicken. Instead, I made a stew of mushrooms using some of the leftover turkey gravy along with chicken stock and then add the cooked turkey at the end. You’ll love this dish. If you don’t have gravy leftover just add another cup of chicken stock along with 1/2 cup of white wine and increase the amount of flour by another two tablespoons. If you know any leftover haters, these recipes could convert them! From by the bay wishing you the happiest thanksgiving and fond food memories! Heat panini press or skillet. Butter two slices of bread. Buttered sides are the outside of the sandwich. 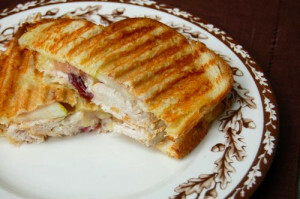 On one side of bread – not buttered spread the cranberry mayonnaise, add the turkey , then pear, proscuitto. Last spread the brie across the top of the proscuitto. Top with the other slice of bread , press down and then toast until cheese is melted and bread browned. Serve immediately. Heat in a dutch oven butter and olive oil. Add garlic, shallots and rosemary and saute for about 5 minutes until softened. Add the mushrooms and saute for another 8 to 10 minutes until mushrooms are also softened and brown. To this add the flour and stir, saute for another minute then add the tomato paste , gravy , broth, bay leave and thyme. Bring to a boil, reduce heat and simmer covered for about 30 minutes. Add the turkey and cook long enough for the turkey to warm in the gravy. Add salt and pepper to taste. Garnish with chopped parsley. Serve immediately accompanied with egg noodles. This entry was posted in main dish, poultry and tagged cranberry mayonnaise, fall foods, fall recipes, leftover recipes, mushroom recipes, panini recipes, stew recipes, turkey recipes on May 24, 2014 by entertainingbythebay. Heat olive oil in a large dutch oven. Season beef cubes with salt and pepper. Brown the beef cubes in batches in the dutch oven and remove and place in bowl to the side. Add onions and garlic to the remaining oil in the dutch oven and saute under softened , about 8-10 minutes. Once the onions are softened add cumin, brown sugar, cayenne, cloves, cinnamon, red pepper flakes and cocoa powder and stir well. Cook for 1 -2 minutes until fragrant. 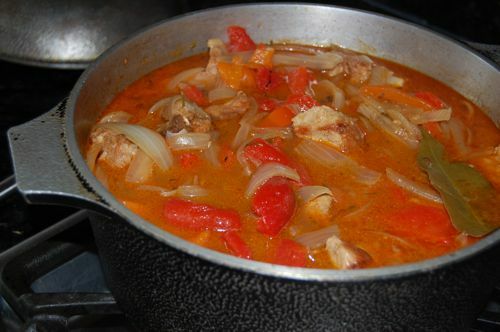 Put the browned meat back into the pot and then add the tomato paste, tomatoes , coffee and bay leaves stir again and bring to boil. Reduce to simmer , covered for 2 hours, until meat is fork tender. Serve warm in big bowls. This entry was posted in beef, main dish and tagged beef recipes, chili recipes, cowboy recipes, Family dinner, stew recipes, western recipes on May 23, 2014 by entertainingbythebay. As we move further into fall, the winds pick up over the water by the bay. It becomes time for meals that are slowly cooked at the stove and shared with family. One of my childhood favorites is my grandmother’s goulash. She was born in Austria and a wonderful cook. I grew up watching her cook for hours. Unfortunately, I never took notes and she had just a few things written down, mostly for baking and just ingredients. I had bits and pieces of recipes from my memories and those of my family. 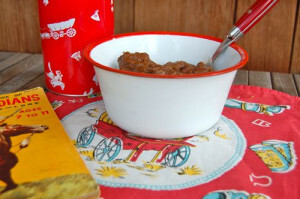 I tried often to recreate grandma’s goulash recipe and it always fell slightly short. It wasn’t until my mom remembered that grandma added a large piece of lemon zest right before serving and oh I think she added a little cognac to the stock in the beginning of the recipe that I finally hit the mark. I admit, I have tweaked the recipe a little more, but only for the better. I don’t think grandma would mind at all. With the bar held so high, when I pleased the family, I knew I finally had it right! So it’s with great pleasure that I share this dish. 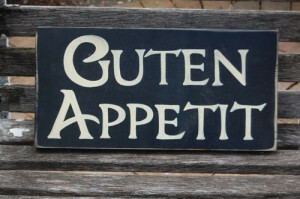 Guten Appetit! Mix flour, salt, pepper and paprika in a sealed plastic bag. Add beef cubes into bag and coated with flour mixture. In a large Dutch oven heat 2 tablespoons olive oil. Sauté floured beef cubes until browned. Remove browned meat into bowl and place aside. Add remaining olive oil to pan and sauté the onions with the sugar until onions start to caramelized. Add the caraway seed, rosemary, thyme, and bay leaf. Sauté until fragrant about one minute. Add the tomatoe paste. Deglaze with the vinegar and stock , then add the meat. Bring to a boil, then lower heat , cover and simmer until very tender, approximately 2 hours. Add one tablespoon cognac and simmer another ten minutes. Remove from heat add lemon zest and serve with noodles, rice or dumplings! This entry was posted in beef, main dish and tagged beef recipes, braise recipes, Family dinner, Family recipes, German food, German receipes, Grandma, stew recipes on May 23, 2014 by entertainingbythebay. The other day I ran into a friend Eva who offered me some hot chili peppers from her garden. 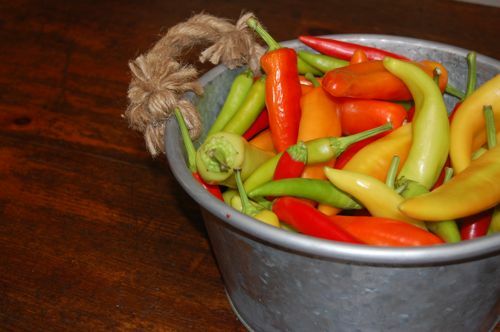 She and her husband Al had a large harvest of hot peppers, too many for them to use. I , of course, jumped at the chance to spend a weekend cooking and experimenting with an ingredient. When the peppers arrived, I was thrilled to have a big bowl of color in my kitchen: all that red, green, orange and yellow. The first thing I quickly tried was a red chili mayonnaise that I planned to use with grilled shrimp as a main course or appetizer. 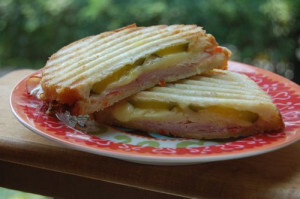 I also thought that the red chili mayonnaise would be terrific to make panini’s -a fun twist on a ham and cheese. 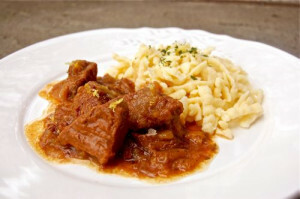 My next recipe I decided to adapt my grandmother’s beef goulash recipe and make a pork goulash, using cubes of pork with peppers and onions for a fiery dish. This meal started with a crostini of toasted bread and fresh ricotta cheese, topped with fresh chopped red chilis, drizzled with olive oil and sprinkled with some coarse sea salt. I wish I had a bowl of chili peppers in my kitchen every weekend and you will too when you try some of these recipes. From by the bay wishing you the hottest of food memories! Word of caution when cooking with chili peppers: I suggest using disposable latex gloves especially if you have sensitive skin, like I do. I also wear contacts and trust me you don’t want to place you fingers anywhere near your eyes after handling fiery peppers! 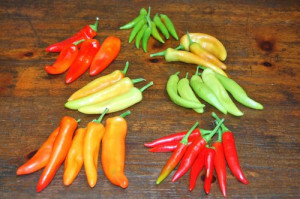 The heat of the chili comes from the seeds and the membrane inside the pepper, so to control the amount of heat in your dish, I suggest removing all seeds and membranes. Place all the ingredients in a food processor and blend well. Heat panini press or skillet. Butter two slices of bread. Buttered sides are the outside of the sandwich. On one side of bread – not buttered spread the chili mayonnaise, add the ham , then cheese and pickles. Top with the other slice of bread , press down and then toast until cheese is melted and bread browned. Serve immediately. Mix flour, salt, pepper and paprika in a sealed plastic bag. Add pork cubes into bag and coated with flour mixture. In a large Dutch oven heat olive oil. Sauté floured pork cubes until browned. Remove browned meat into bowl and place aside. Add remaining olive oil to pan and sauté the onions with chili peppers until softened. Add the caraway seed, rosemary, thyme, and bay leaf. Sauté until fragrant about one minute. Add the tomatoe paste. Deglaze with the vinegar and stock , then add the meat and roasted peppers. Bring to a boil, then lower heat , cover and simmer until very tender, approximately 2 to 2 1/2 hours. Remove from heat add lemon zest and serve with noodles or rice. This entry was posted in main dish, pork, Sandwiches and tagged chili pepper recipes, goulash recipes, ham recipes, panini recipes, pork recipes, red hot chili peppers, stew recipes on May 23, 2014 by entertainingbythebay.